LOGAN, UTAH — Campbell Scientific, a manufacturer of research-grade measurement instruments for over 43 years, is now offering the accurate, affordable CS320 heated digital thermopile pyranometer. It is ideal for measurement of global solar radiation, even under overcast and cloudy weather conditions. Its heated sensor, blackbody spectral response, and digital output will provide you with even more confidence in your data. The CS320 consists of a precision, cosine-response sensor head, thermopile sensor, heater, and signal-processing circuitry mounted in an aluminum housing, where the electronics are completely sealed. The dome-shaped sensor head allows dew and rain to run off. The blackbody detector allows the CS320 to provide superior spectral response compared to similarly priced silicon-cell pyranometers. And it comes at a much lower price than other thermopile sensors. The CS320 sensor can be removed from the detachable cable and replaced with a freshly calibrated sensor with no programming changes to the system itself. Calibration coefficients are stored within the sensor head, and the digital SDI-12 output (in W/m2) eliminates measurement errors associated with analog pyranometers. 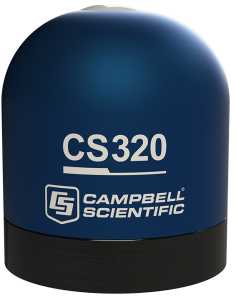 To learn more about the CS320, or to ask questions of the company’s highly trained technical and sales support team, please visit: www.campbellsci.com/new-cs320.